WC and Mrs. WC spent Easter weekend conducting a Short-eared Owl Survey in Camas Prairie. The owl survey is a very small piece of a four state program of citizen science. This survey is north of Camas Prairie. Since Idaho has at least three places called “Camas Prairie,” WC should explain this is the “Camas Prairie” is along U.S. 20 between Mountain Home and Sun Valley. While the citizen science is important, it’s also a great opportunity to explore and bird Centennial Marsh and the surrounding area. Photos were taken. While WC saw a lot of birds besides raptors, WC will make raptors the subject of this post. Golden Eagles are usually pretty tough to find and photograph. WC saw six in Camas Prairie. The most common big raptor was Swainson’s Hawk. There were 37 across two days of birding. Red-tailed Hawks were less common but still present in decent numbers. The smaller raptors were also present, including American Kestrels. This gentleman’s colors look almost painted in the early dawn light. The raptors are there because the prey are there. 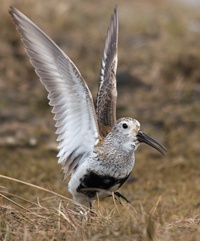 Ground squirrels, voles and mice for the smaller raptors; waterfowl, shorebirds and upland birds for the larger birds. If you’re a raptor, Centennial Marsh is an old-fashioned smorgasbord, an all-you-can eat buffet. Whether it’s a feeding stop on the way further north, or a place to hatch and feed chicks, it an important place. And a terrific place for birders. Great pics! We also did a SEOW survey on Easter…can’t think of a better way to spend the evening! Absolutely splendid composition with that red-tail. Very nicely done!